CARMEL-BY-THE-SEA ADOBE INN (800) 388-3933 Dolores & 8th, Carmel, CA 93921 www.adobeinn.com Sergio Javier info@adobeinn.com Elegant, new, luxurious oversized rooms, wet bars, fireplaces, ocean views, fridge, cont. bkfst. delivered, WIFI, heated pool/sauna, free parking garage. BEST WESTERN TOWNHOUSE LODGE (831) 624-1261 San Carlos St & 5th Ave Carmel, CA 93921 www.carmelbestwestern.com Nilam Patel carmelbestwestern@gmail.com Center of village, gourmet restaurants & art galleries 1 min. away. Short walk to beach. 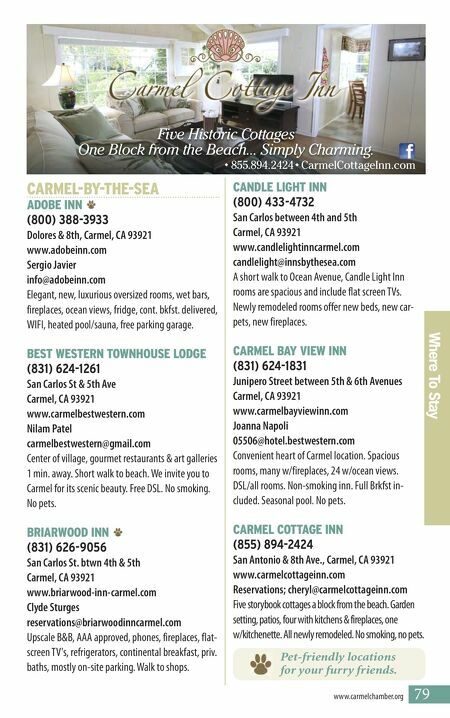 We invite you to Carmel for its scenic beauty. Free DSL. No smoking. No pets. BRIARWOOD INN (831) 626-9056 San Carlos St. btwn 4th & 5th Carmel, CA 93921 www.briarwood-inn-carmel.com Clyde Sturges reservations@briarwoodinncarmel.com Upscale B&B, AAA approved, phones, fireplaces, flat- screen TV's, refrigerators, continental breakfast, priv. baths, mostly on-site parking. Walk to shops. CANDLE LIGHT INN (800) 433-4732 San Carlos between 4th and 5th Carmel, CA 93921 www.candlelightinncarmel.com candlelight@innsbythesea.com A short walk to Ocean Avenue, Candle Light Inn rooms are spacious and include flat screen TVs. Newly remodeled rooms offer new beds, new car- pets, new fireplaces. CARMEL BAY VIEW INN (831) 624-1831 Junipero Street between 5th & 6th Avenues Carmel, CA 93921 www.carmelbayviewinn.com Joanna Napoli 05506@hotel.bestwestern.com Convenient heart of Carmel location. Spacious rooms, many w/fireplaces, 24 w/ocean views. DSL/all rooms. Non-smoking inn. Full Brkfst in- cluded. Seasonal pool. No pets. CARMEL COTTAGE INN (855) 894-2424 San Antonio & 8th Ave., Carmel, CA 93921 www.carmelcottageinn.com Reservations; cheryl@carmelcottageinn.com Five storybook cottages a block from the beach. Garden setting, patios, four with kitchens & fireplaces, one w/kitchenette. All newly remodeled. No smoking, no pets. Where To Stay www.carmelchamber.org 79 ◆ 855.894.2424 ◆ CarmelCottageInn.com Five Historic Cottages One Block from the Beach... Simply Charming. 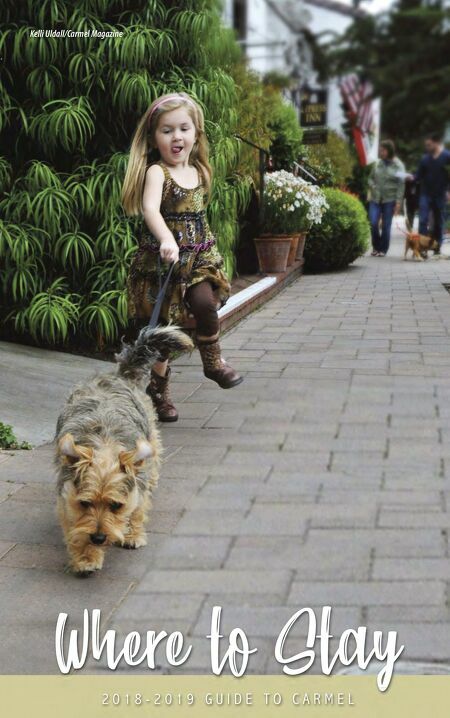 Pet-friendly locations for your furry friends.